Thanks. Never had done any digital codes before so I wasnt sure how that worked. Of all the sites what would you suggest is the best to use digital codes on? Vudu, Hulu? Are any of them free site options? 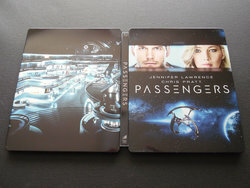 Best buy sent me an extra early digital copy of passengers. So heres a screenshot of the email with the code and how to use it. Whoever uses it post a reply so others don't try to use it. Hmm still not available for pre order. Anyone know if this will be super limited or if Best Buy's inventory management just stinks? The code was taken apparently. Someone was just too busy to post a reply. My copy is out for delivery which is great since it was scheduled for tomorrow originally and I doubt it would have been delivered due to the approaching blizzard. Turned out nice. Got my copy today. Haven't opened it yet but looks mint as far as I can see! Anyone have a spare copy for me in the UK ? I think this actually turned out decent, I like it, especially the way the ship and the planet's atmosphere glimmer when the light hits just right. In store pre-order is now open again online... go and get it! Good Luck! Was supposed to be in Bangor today to pick this up but with the storm I called it off. But I really don't like that art at all, Happy for those of you that snagged it that like it. Just ordered from Zavvi. Think the 3D + 2D discs are Region A locked. I have confirmation from another forum that the 3D disc is region free. Anyone help me out from the USA ? Interesting. 2D disc is Region locked as per dvdbeaver. Is it just me or does Best buy seem to be doing small runs of steels lately. Moana was maybe 4 copies, this was only 3 and one was dented. Surprised by the quality of this SteelBook and the movie is good too. Good to see our local boy Chris Pratt doing well on the big screen. Did you ever get a copy? Only have gotten through half way and so far is a borefest. I hope it picks up. Watching in 4K and I am not wowed by it. Will restart and watch in 3D.